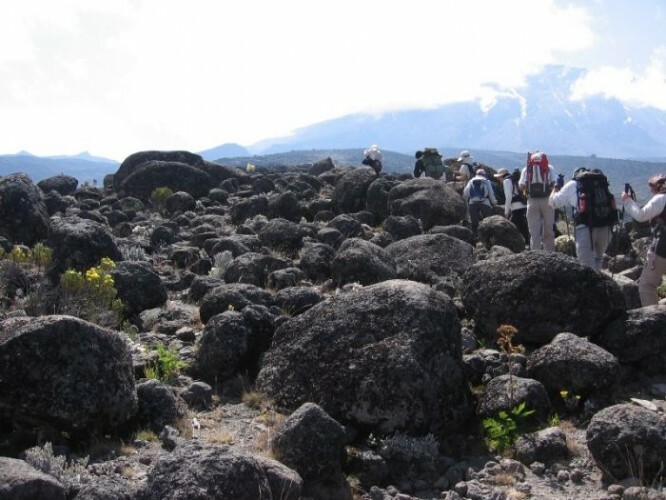 Marangu Route is the easiest and shortest route to Kilimanjaro’s summit. Commonly referred to as the “Coca Cola” or “tourist” route. Marangu route boasts of being the only route on Kilimanjaro with the comforts of solar-powered sleeping huts and beds at each camp. There are communal huts and each bunk has a sponge mattress and pillow. There are 60 beds at both Mandara and Kibo Huts and 120 beds at Horombo Hut. The two lower huts have got bathrooms and running water facilities while the last camp provides basic men’s and ladies’ latrines. There are common dining huts to share meals. Soft drinks, bottled water, and beer may be for sale at the huts. It’s advisable to bring small Tanzanian bills to purchase these items (prices increase with elevation). This route is usually done in 5 days, could be done in 6 days for better acclimatization. The extra day could be spent resting at Horombo or climbing to a basecamp below Kibo’s sub peak Mawenzi. Day 1:Arrive Kilimanjaro International Airport. You will be met at the airport and transferred to a hotel that suits your budget in Arusha for dinner & overnight. Your guide will come and brief you at the hotel in preparation for the next day’s climb. After breakfast depart Arusha to Marangu Gate on the eastern side of Kilimanjaro, register with the national park, and begin hiking by 10:30 a.m. The rainforest here is characterised by towering Eucalyptus trees, bird life, and Colubus monkeys. At these lower elevations, it gets wet and muddy, thus gaiters and trekking poles come in quite handy. Shorts and t-shirts should be sufficient, but keep your rain gear and warmer clothing available. You will stop halfway for lunch, to reach Mandara Huts between 2 and 3 pm. Have some rest & enjoy tea or coffee. You will be served dinner at 7pm. Bathrooms & running water is available for showers. Have an early breakfast at 7:30am and get ready for your next trek. Break camp by 8:30a.m,hike for an hour through rainforest glades, then follow an ascending path through heath land where you can look for giant lobelias and groundsels. Continue up into open moorlands where small shrubs are the main vegetation. Stop halfway for lunch, where you can enjoy amazing views of Mawenzi. Arrive at the Horombo Huts by 3 pm, where you can see Kibo’s summit. Rest, unpack, and prepare for dinner. Bathrooms with running water are available. You may start to feel the effects of altitude here, and to aid your acclimatization, you can choose to spend an extra day resting at Horombo or climbing to a base camp below Kibo’s sub peak Mawenzi. Enjoy an early breakfast & get the opportunity of getting some great photos of the sunrise, to begin your trek. The first part of the day’s hike climbs through the dwindling heath land that blends into a moonscape as you enter the sweeping saddle connecting Mawenzi and Kibo. When you stop for lunch, and later when you cross this surprisingly large saddle, you can examine the summit climb up Kibo that you will be starting in just a few hours. Kindly note there is no running water at Kibo Huts, be careful to notice any signs of altitude sickness. Wake at midnight to a light breakfast, and then prepare for your summit ascent. The goal is to climb before dawn so that you can reach Uhuru Peak shortly after sunrise. Leave at 1 AM, switchback up steep scree or possibly snow, and reach Gilman’s Point on the crater rim at 5,861 m/18,640 ft between 5 and 7 a.m. Here, views of the fabled crater and its icecaps greet you. Another 2 hours of hiking along the crater rim near the celebrated snows takes you to Kilimanjaro true summit, Uhuru Peak, by 9a.m. This is Africa’s highest point, and climax of your trekking! After your summit stay, descend back to the Kibo Huts, have lunch, rest, collect your things, and re cross the saddle to the Horombo Huts. Eat dinner and get some well-deserved sleep! You do the beginning of this climb in the dark with headlamps or flashlights. It will be very cold until you start descending, so you will need all of your warm layers. This is, by far, the most difficult part of the trek. Slowly slowly, or, “pole pole,” and an optimistic attitude will get you there! After breakfast and refreshing; descend through the moorland to the Mandara Huts. Have lunch there then continue your triumphant recessional down through lush forest to the park gate, which you should reach around 2 or 3 pm. Kindly tip your guides and porters as you will be leaving them here. A vehicle will take you back to your hotel in Arusha. Depart for the airport or other destinations of your choice. A transfer to the airport can be arranged at a reasonable fee. A beach excursion is a better way to recuperate, we can arrange!